The Falcon Bipod Claws are made from 304 stainless steel. The basket style claws help displace weight and provides stability in loose ground. The hinged claws allow for maximum 360° contact on uneven ground. 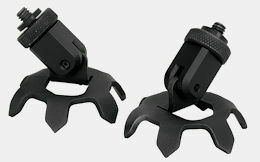 The claws and hinge combination provide maximum support and contact when shooting in an austere environment. This package does not come with the Falcon Bipod. Claw Feet ONLY. Chassis made in Canada by Cadex Defence Inc.